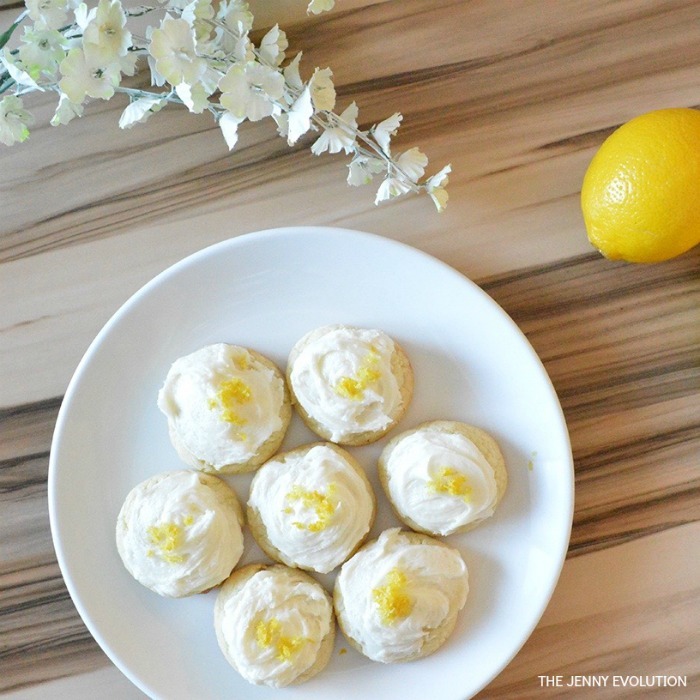 Jump into happy, sunny days with this lemon cookies recipe that will wake up and delight your taste buds. What is it about the warmer months that gets me thinking about lemons? Could it be that they just look so sunny? Or maybe my taste buds are ready for to wake up and enjoy some zing now that there are finally leaves on the trees again. 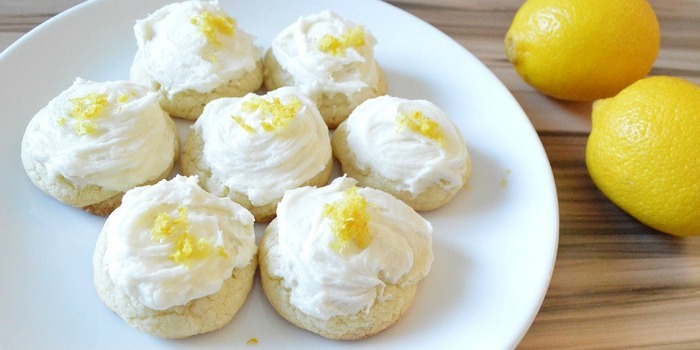 Either way, I’m excited to be sharing this lemon cookies recipe with you. You’re going to love the combo of sweet and slight zing along with your favorite buttercream topping. This post contains affiliate links. 1. Preheat oven to 350 degrees and line cookie sheet with parchment paper. Set aside. Make sure your butter is at room temperature. 2. In one of your medium-sized bowls, mix together flour, baking powder and salt. Set aside. 3. In your second medium-sized bowl, cream butter, sugar, egg, and vanilla together. 4. Take your bowl of dry ingredients and in thirds, slowly add into butter-sugar mixture. Fold and mix until ingredients take the consistency of cookie dough. 5. Squeeze your lemons to get the 2 tbsp of lemon juice. I use a lemon squeezer. 6. Grate the rinds of 2 lemons using a zester. 7. Add in your lemon juice and half of your lemon rind to the mixture. 8. Roll cookie dough into 1-inch balls and place on lined cookie sheet. 9. Bake for 12 to 14 minutes. 10. 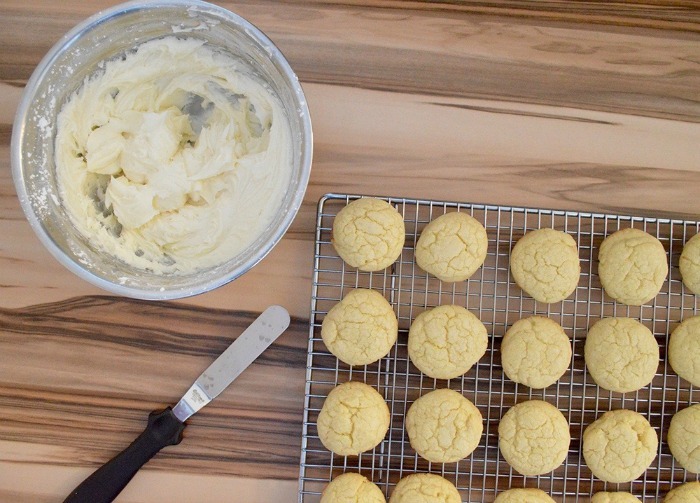 Once cool, top each cookie with your favorite buttercream recipe and sprinkle remaining lemon zest on top. 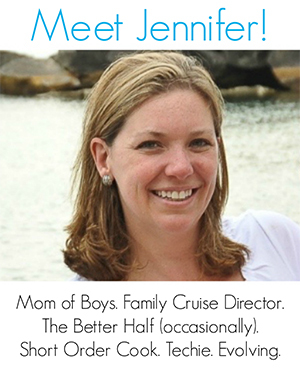 Find more inspiring recipes on The Jenny Evolution! Preheat oven to 350 degrees and line cookie sheet with parchment paper. Set aside. Make sure your butter is at room temperature. 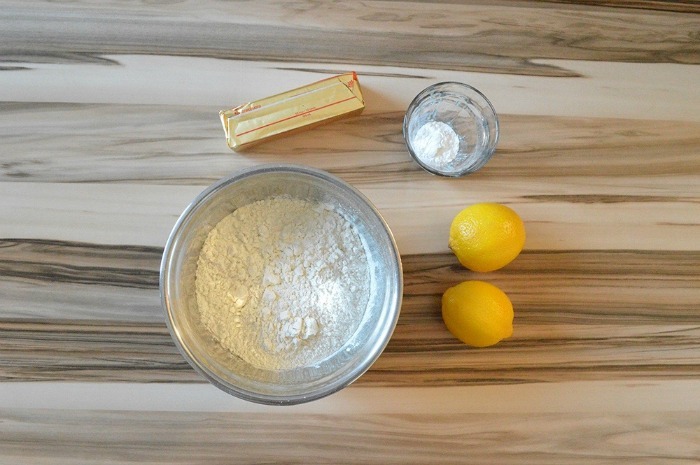 In one of your medium-sized bowls, mix together flour, baking powder and salt. Set aside. In your second medium-sized bowl, cream butter, sugar, egg, and vanilla together. Take your bowl of dry ingredients and in thirds, slowly add into butter-sugar mixture. 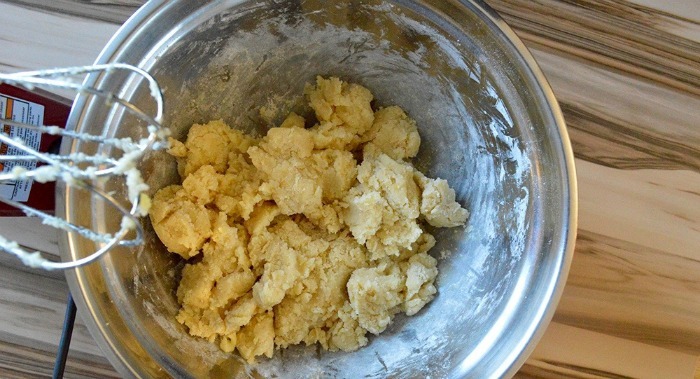 Fold and mix until ingredients take the consistency of cookie dough. Squeeze your lemons to get the 2 tbsp of lemon juice. I use a lemon squeezer. 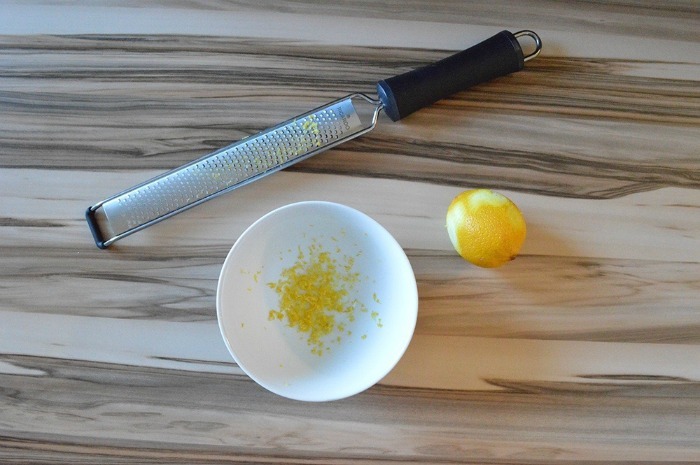 Grate the rinds of 2 lemons using a zester. Add in your lemon juice and half of your lemon rind to the mixture. Roll cookie dough into 1-inch balls and place on lined cookie sheet. Once cool, top each cookie with your favorite buttercream and sprinkle remaining lemon zest on top. Oh! Those looks really good! I am pinning that for later. Thank you for posting! Happy baking. These are super delish! Flower flour, well that’s a new one I will definitely have to try. These look so yummy and perfect for this Spring weather. Gak!!! Not sure how I wrote that. Thanks for the heads up. Love lemon. Thank you. Your site is so refreshing. I enjoy it. These looks so yummy! Thanks for sharing Think Tank Thursday. 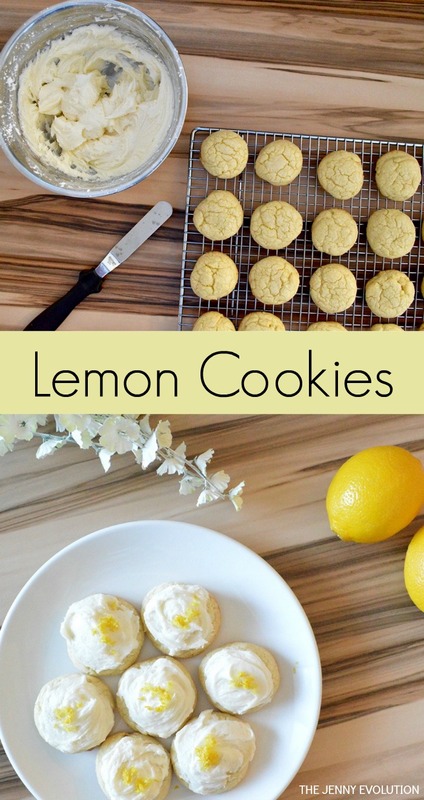 Yum – anything lemon is one of my weaknesses – these sound fab! Thanks for sharing found you at Saucy Saturday! I love lemon! Thanks for linking up at the Best of the Blogosphere Linky Party! Oh Jenny – you’ve appealed to a secret part of me. You see, I love desserts but there’s something about the combination of lemon and spring. I could probably scarf down a dozen of these in no time flat lol! Hee hee! A little indulgence once in a while never hurt anyone. Happy baking! Looks so yummy. Pinned & shared. Thanks for sharing at the #InspirationSpotlight party. See you again soon!